Pardew proffers plaudits: 8/10 for the season, says the manager | NUFC Blog. Newcastle United manager Alan Pardew has been rating the team’s overall performance for the 2010/2011 season. 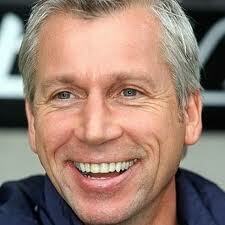 Alan Pardew thinks we’ve had a good season, as do most fans. We’re a newly promoted side and it looks like we’re heading for a mid-table finish and may even sneak into the top 10, which is not to be sniffed at. I presume he means out of ten, although he doesn’t actually say. If he means eight out of a hundred then that’s not so good! Personally, I always score things out of 11 so that you have a mid-point rating at 6/11, but then again I’ll be the first to admit I’m weird. “In terms of the expectations and the amount of finance that was spent in the summer, the fact that we lost Hatem to a broken leg, that we sold Andy Carroll, yes, I would give it as high as that. “Possibly. If you looked at our squad, you would have to say on paper, it didn’t look the strongest for the results we have had, and that’s a great thing. Yes indeed. All eyes will now be on the summer squad strengthening as we prepare for the 2011/2012 season. Most Toon fans are realistic – despite the media’s cynical attempts to paint us otherwise sometimes – so maybe a top half finish is a fair aim for next season. Top 8 would be nice but let’s not get too ahead of ourselves and build up too many expectations. There is, after all, supposedly a 5-year plan to establish us as European contenders. “I can only talk from my personal fulfilment as a football manager at a great club, and it has been fantastic on that front. I more or less agree with him there. We have finished better than I would have said at the outset as I was thinking that we might have found ourselves in a relegation dogfight, but I suppose I should have had more faith in my team. Hopefully we can finish on a high against The Baggies and settle back to watch the summer transfer deals with interest. Why don’t you get back into bed. Summer, Buddy Holly, the working folly. Good golly Miss Molly and boats. Hammersmith Palais, the Bolshoi Ballet. Jump back in the alley and nanny goats. Incredible that the difference between a whole season being 8 or say 4 is at this point about 5 points. One win and a couple of draws. Not much. So says a bloke who’s been promised £35m ? Some of the results were down right scandalous, B’pool B’burn wigan stoke fulham bolton everton spurs home were points dropped 2 or 3. then WBA away B’pool blackburn wolves mackems the list goes on. what cd have been. but we also did well against some of the top teams away too. Human Nature Clint wants more everytime. Does it not show poor motivation for these so called smaller teams. CLINT,its been a funny old season all round imo not the normal PL,but nowts cast in stone m8,who would pick b/pool to stuff the gunners away from home ect ect. It has been a well weird season mate. Although, last season showed signs of this, but cos we were down, we didn’t notice so much. But this takes the cake for weirdness. i hear ya’ mate, if we took the points we got from manusa, chelsea, arse, liverpoop, everton & villa & swapped ’em for points from blackpool, stoke, fulham etc. We’d probably be around the same place. As it is, we’ve shown we can take points from higher placed teams & just have to get tight & greedy at home v some of the ‘so called’ lesser teams. For example if you look at it like we lost at home to stoke and blackburn, but beat everton and arsenal away thats 6points we expected to get, just got them in games we thought we wouldnt. You could also think about what could have been, like throwing away points at sunderland and at home to tottenham, but then think of arsenal home and chelsea away! We have had an excellent season regardless, everyone put us down from the start and come sunday we may have a top ten finish. Brilliant. I really hope the squad gets improvement come summer, it would be a crime not to build on from this season. you say ‘human nature always wants more’. That’s a recent ‘western ideal’, first propagated after wwII by the P.R. ‘guru’ Edward Bernays (Freud’s nephew), when he decided to replace ‘need with desire’ in the U.S. to sell more product. While you could argue that people always ‘want’ more, they always had the ability to get more but never really had the belly for a fight. So, despite safety in numbers ‘want’ has never really turned into ‘need’ & therefore we sit on our collective arses waiting for ‘more’ to be delivered, on a silver platter. let’s not let that get in the way of a bit of ‘engineering of consent’, hey? Yes the fact we never knew what team would show up at any given time or game, was a bit wierd. An example was the Arsenal game, where second half expectations were, to keep the loss as acceptable as possible. Then following the sending off and morale collapsing arsenal reaction, the side came to life with quite an amazing comeback and were unfortunate not to get the win. But overall it was a case of a side punching above their weight, a side with a small bench, resulting in having to play the same small squad, a tired squad, sometimes with minor injuries. This has to be remedied by bringing in reinforcements and I dont mean introduce more of our kids, who in general are still unready. There are other teams with smaller squads than us. chelsea, blackpool to name 2. Hmm, instead of rating from 1-11…which is odd. Why not rate from 0-10? Unfortunately that information is classified. If the value of the players in the first team squad is a yard stick, ours is currently around the thirteenth most valuable in the Premiership, and we are currently twelfth in the division. “There are other teams with smaller squads than us. Sixteen Premiership teams have smaller squads than our official first team squad, there’s quantity and quality though. For example, Blackpool and West Ham have the largest with thirty and thirty two respectively and Everton and Chelsea have the smallest with twenty and twenty two respectively. Our squad has twenty nine first team players. i knew someone would get in there, ta.